This is Lily’s. She stuck the stickers on the front after we stuck it to the wall. She likes to move hers around her room, and so far it is still sticking. How do you use contact paper in your house? 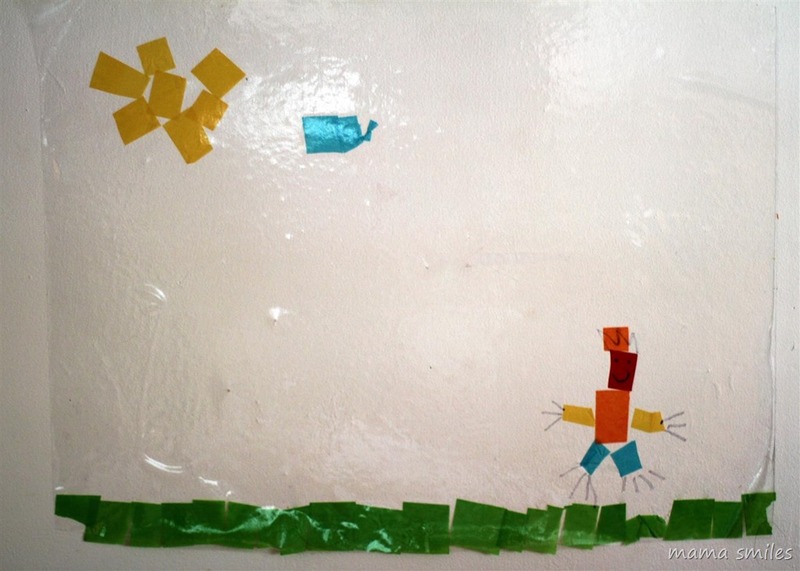 Do you have a favorite mixed media art activity for kids? I’ve been wanting to do a contact paper craft but I never remember to buy the contact paper. These are so cute – I love how Johnny added the face and hands. We were out of it for a long time. It’s such a fun craft supply, when we have it on hand. We haven’t used contact paper much. 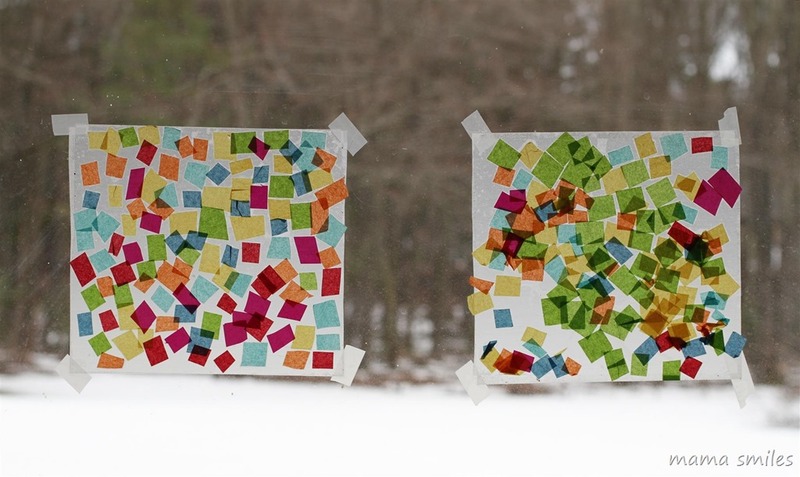 Love all the colorful squares from the tissue paper. I love that it is virtually mess-free. We’ve used them to make window decorations. Contact paper is perfect for that! Wonderful idea. I like it that kids can move it around and it doesn’t leave any mark anywhere. My daughter loves that feature! What a great idea! I have not use contact paper but I bet it would be a great rainy day activity for the little one! It’s one of my favorite rainy day activities – it can keep kids busy for quite a while, and the only mess is the little tissue paper squares, which are easy to sweep up! Great Idea! 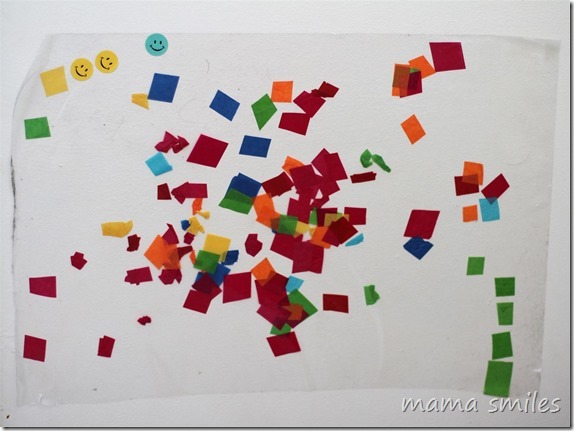 We did few similar activities with contact paper as well! Contact paper is such a great, kid-friendly crafting material! So cute and colorful! I love hanging my kids art all around the house, I feel it makes it a home! 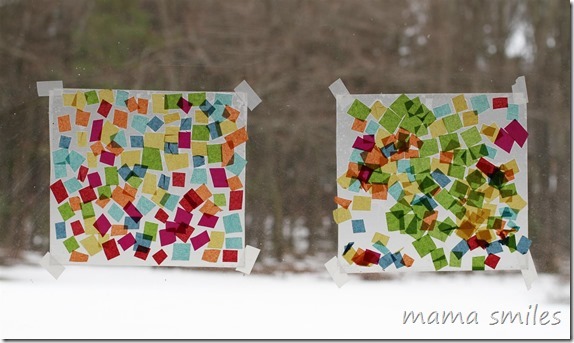 Oh I love this idea for a mess-free craft – so much scope for creativity!! Is it difficult to cut out the tissue paper squares so evenly? I’ve never tried to use tissue paper for anything but gift wrap. It’s not hard at all – I wasn’t even trying to do it particularly evenly. I think it is easiest if you cut multiple layers at a time – maybe 4 or 5. Cool! My kids made ones with flowers and leaves in preschool. They still look great! I have one hanging in my car and one in the living room. I should get some. It looks like it makes collages so easy! I’m planning to do some flowers one this spring – they are so much fun! They came out so beautifully! I love how fun and easy this art project is! That is exactly why it’s one of my all-time favorite toddler crafts! Simple, fun, no-mess, and the end result looks great! 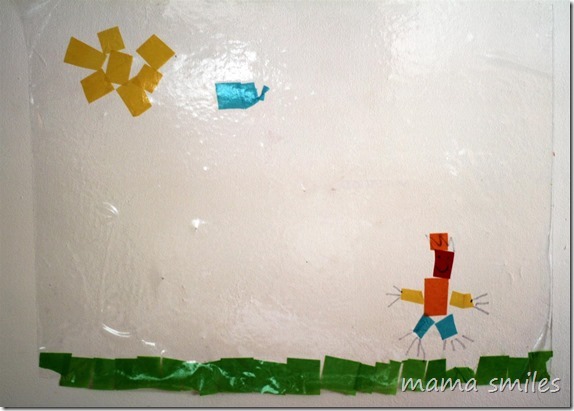 I love this activity – and how EASY (you know me, it’s gotta be easy if it’s art) it is! We are going to do this! On my list of things to do with the kids! I think all moms need a big collection of EASY activities! BTW, did you just use glue to stick the tissue squares to the contact paper? The contact paper is sticky on one side (once you remove the backing paper) – the tissue squares stick to that. ZERO mess!